in the world of technical textiles. Material bonding technology is the core competence of the company. Individual, customized solutions are acquired customer and project oriented. Thus we are enabled to work quickly and flexibly in a widespread market. Besides textiles and natural materials we also compound artificial materials, e.g. foam materials, foils, fleece, and leatherette, whether by various laminating, quilting, or classic sewing techniques. Cuttings, punched parts, commission and manufacture complete our range of services reasonably and usefully. Our employees� high level of skills and training gives you the guarantee of a standard high quality. Both our production sites are located in Germany. „Made in Germany” is still a symbol for quality, which we are maintaining, continuing and developing. We combine what belongs together! 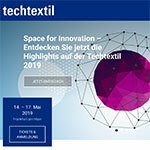 Visit us at our booth C75 Hall 3.1 at „techtextil” Fair from May 14th until May 17th 2019 in Frankfurt, Germany. !